NOTE: This review pertains to the original Japanese release of Godzilla, and not the American 1956 edit starring Raymond Burr. Japan is still recovering from having been bombed twice with atomic weapons. In the meantime, more nuclear bombs are being tested in Japanese waters. The immense radiation resulted in the awakening of Godzilla, a two-million year old monster that is now stomping its way through Tokyo. Will Japan make it through this, or does this spell the end of Japan as well as that of the rest of the world? 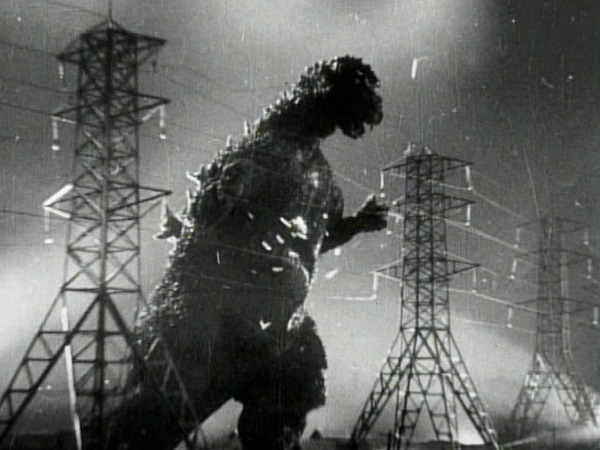 Godzilla (ゴジラ, Gojira) has the makings of a typical Cold War-era monster movie. Most of the movie is Godzilla wreaking havoc on Tokyo having destroyed several ships as people cower in shelters. However, when seeing this movie, it is very important to remember the context in which it was made. World War II had ended less than a decade prior to the movie’s release, and the bombings of Hiroshima and Nagasaki were still fresh in the minds of Japanese people. Thus, the movie is a pretty obvious criticism of the use of anything that is too powerful for mankind. Dr. Serizawa (Hirata Akihiko) developed the Oxygen Destroyer (I wish I was making this name up) and refused to allow the existence of the device to be made public lest it wind up in the wrong hands. When it became clear that it was the only weapon that can defeat Godzilla, Serizawa (himself a World War II veteran) made sure it wouldn’t be used ever again. While the special effects seem cheesy to me in 2011 (It was a little too obvious Godzilla was a man in a suit walking through a model of Tokyo that reminded me of photos in Model Railroader), they were more than enough to impress audiences of the 1950s. Nonetheless, I thought the main cast members (particularly Seven Samurai veteran Shimura Takashi) were rather underused throughout the movie and the relationships between characters were a little clumsily handled thanks to some poor pacing. Quite frankly, Godzilla was by no means a masterpiece in filmmaking. However, mainly because of the context, Godzilla is an important part of Japanese history. At the time this movie was made, the Soviets and Americans were in their nuclear arms race, and if the Cold War heated up, Japan could very have been right in the thick of it. The movie actually feels all the more relevant in 2011 after the disaster at Fukushima back in March.